Road access to Dubai International, the world’s busiest airport for international passenger traffic, is set to improve by the end of this year when phase one of the Airport Road expansion project is completed. The AED404 million (US$101 million) redevelopment of this major roadway includes the construction of several multi-level intersections with half of the work almost finished and the entire project set for completion by mid-2018. Mattar Al Tayer, director general and chairman of the Board of Executive Directors of Dubai’s Road & Transport Authority, recently announced that 50 percent of work on the development of the Al Rashidiya-Casablanca Road intersections had been completed, while 40 percent of the Nad Al Hamar and Marrakech Road intersections were now ready. Al Tayer reiterated that the first phase of the project would open in December this year. He issued the statement following a recent inspection of the project site. The project includes the construction of bridges and a tunnel at the Marrakech Road intersection and bridges at the Al Rashidiya intersection, as well as the Airport Road junctions with Casablanca Street and Nad Al Hamar Street. 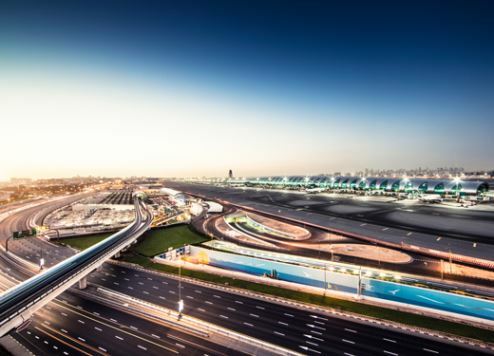 “The ‘Improvement of Airport Road Project’ is part of RTA’s plans to accommodate the projected growth in the number of passengers using Dubai International Airport, which is expected to shoot to 92 million passengers by 2020,” said Al Tayer. The expansion project will increase the capacity of Airport Road by an additional 5,000 vehicles per hour, improving traffic safety at the same time. The new road will help reduce transit times on Airport Road from Sheikh Mohammed Bin Zayed Road to Casablanca Street from 30 minutes to just five minutes, according to the RTA.